I started practicing yoga over twenty years ago when I found a copy of B. K. S. Iyengar’s book Light on Yoga on a sale cart at a local bookstore. I’ve been practicing, at various levels of commitment and in various styles, since then. In fact, when Dan and I first became friends, one of the first things we did together was to start going to a yoga class together on the weekend (he fell over in downward dog during that first class!). So I’ve been practicing yoga for more than half my life now, and through my practice I’ve not only gained flexibility and strength, but also a deep understanding of my own body. As I’ve aged, I’ve noticed my body going through changes. I’ve lost some flexibility. As I’ve grown softer with age, certain postures have changed, and I’ve found myself more willing to embrace props and assistance. I’ve also noticed changes in yoga culture in the States (why does no one do hands-on adjustments anymore?). But pregnancy has given me even more to ponder as I learn about my rapidly-changing body. It is an odd paradox that pregnancy simultaneously makes certain parts of your body more flexible, while restricting your mobility in other ways. For example, I’m very careful when I do side stretches these days but I can’t do as deep a forward fold as my growing belly gets in the way. That said, I’ve found that yoga has been one of the best ways to keep me feeling good during my pregnancy. Even when my nausea was bad, I would modify my way through the weekly class a colleague of mine teaches at my office because I knew I’d feel better afterwards than when I started. And since my nausea has abated and my energy has increased, I’ve started looking at ways to modify my own home practice for pregnancy. While I typically do a blend of Ashtanga and Iyengar yoga that I’ve developed for myself over the years, I no longer feel the desire to do strenuous vinyasas or standing poses, in addition to the general prenatal yoga guidelines of avoiding closed twists and positions that compress the belly. So I’ve started looking around for guidance on prenatal sequences. That was when I found this sequence from a blogger I follow. Apart from the graphic just being adorable (I have a poster print of it to hang in my yoga room), the sequence is a lovely blend of restorative, but still effective. I already walk a fair amount and have even started up my barre classes again, so I don’t rely on yoga for aerobic exercise, or even rigorous strength-building, but the suppleness and mobility is key for both keeping my body limber as it changes, and preparing me for labor. Of course, I can never leave well enough alone, so I don’t just do this sequence. I hold each pose (on each side, if indicated) for ten deep breaths, which takes me about a half an hour or so. I generally use a couple blocks as props, especially for the lunging sequence (I do low lunge, lizard pose, and half monkey stretch as a sequence on each side before switching to the other). The sequence requires very little space to do and I can even roll out a mat in my office and do this sequence during my lunch break when I feel creaky. 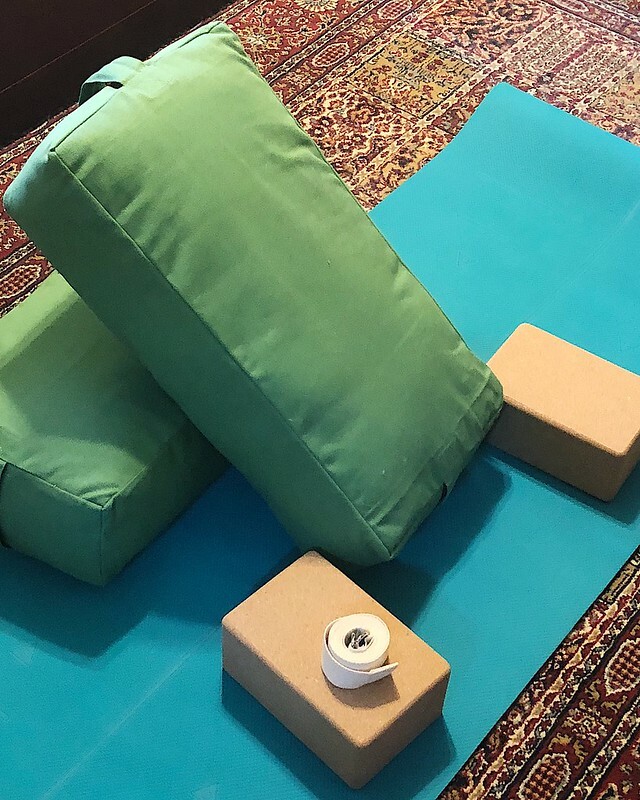 If I have the time, I like to set up my bolsters and prop up into a supported reclined bound angle pose for five minutes at the end in lieu of Savasana. 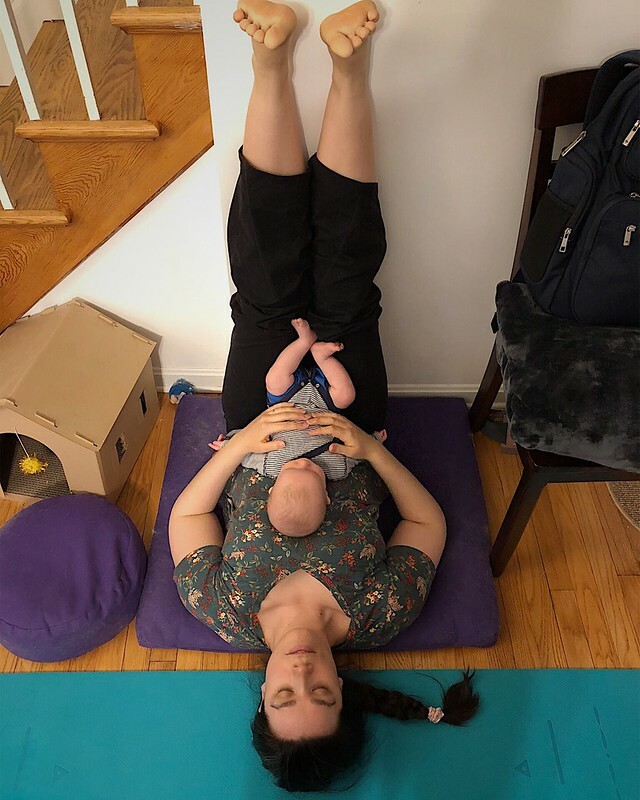 If not, I just hold Child’s Pose for as long as I need to close my practice. I think the best thing I’ve learned from pregnancy is echoed in this sequence: I’ve learned to listen to my body and back off when I need to. I don’t always need to push and excel and sweat to feel like I’ve done something good for myself. Sometimes I just need to gently stretch my body and then have a nice cup of tea and a rest. NB: I am not a certified yoga instructor and cannot give advice on your yoga practice. This post is intended as a description of my personal practice, which you can use to build your own practice, but if you’re unsure or new to yoga, please talk to a qualified teacher first.